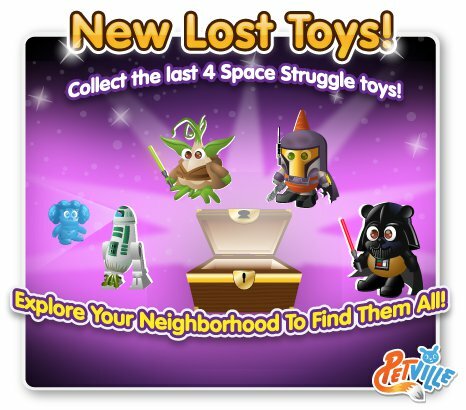 Earlier this month, PetVille launched a new set of lost Space Struggle toys, beginning with the first four in the set. Tonight, the final four have been added to the game. These adorable space toys are quite clearly modeled after Star Wars - and the four latest released toys are mirror images of R2-D2, Yoda, Boba Fett, and Darth Vader. These toys are found randomly in treasure chests that can be found in your neighbor's pet's homes. Once found, you are prompted to post a notice on your wall telling your friends that you found the toy. This means that in order to actually obtain these pets, you'll have to scour over your friend's wall postings to find a friend who has found and posted about the toy you're looking for. This Space Struggle set includes 8 lost toys in total, which can be used to decorate your pet's home. How close are you to finishing your PetVille Space Struggle toy collection? Which ones are you missing?